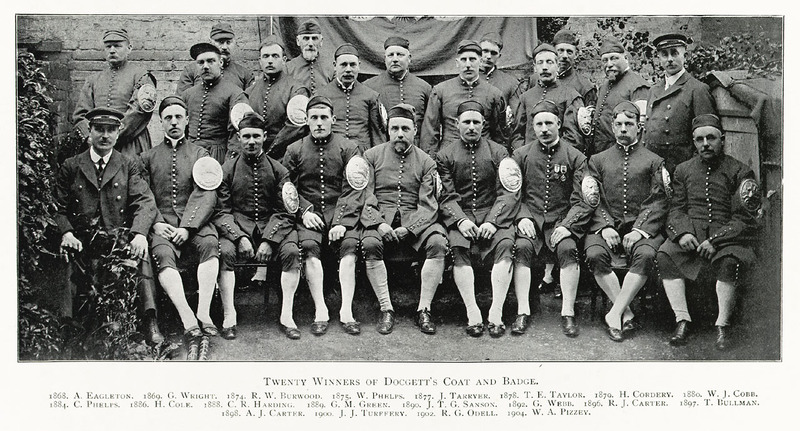 Twenty winners of the Doggett’s Coat and Badge, 1868 – 1904. Run since 1715, ‘Doggett’s’ is a prestigious yet little-known sculling race that is open only to those newly qualified to work on the River Thames. Each of the Doggett’s winners in this picture must have had a fascinating life story to tell, but, probably few (if any) of these tales were ever recorded and they are now lost forever. Tim Koch bookmarks a new online favourite. The start of the 2016 Doggett’s Coat and Badge, a historic race on a historic river. 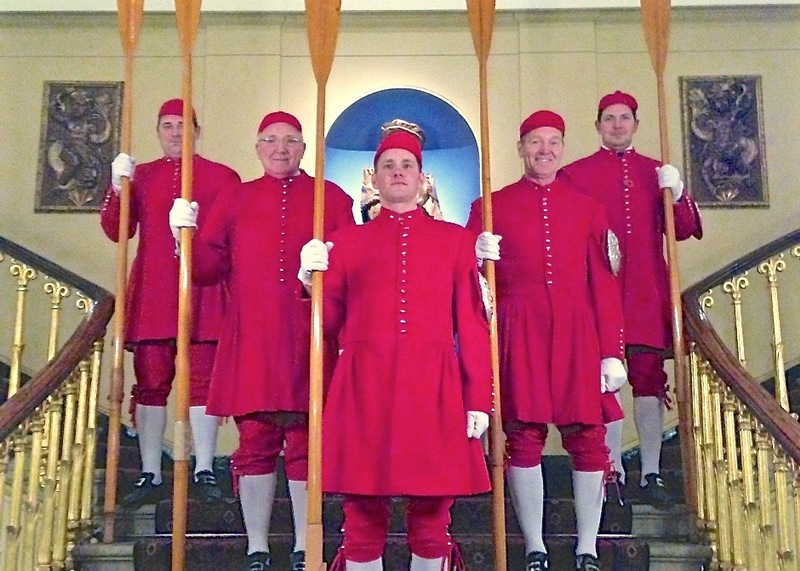 Picture: @DoggettsRace. 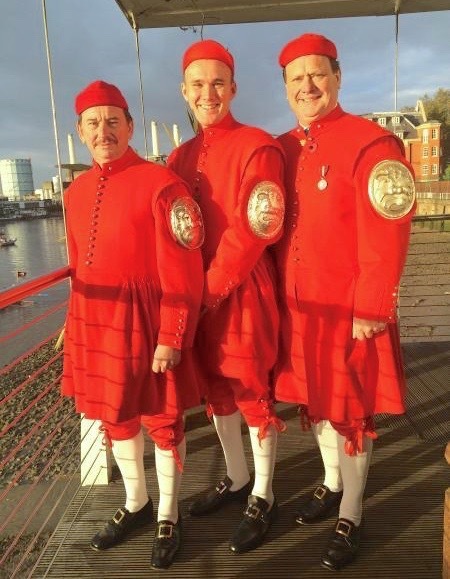 As part of this mission, the Trust has been working on a heritage project exploring the history of the Doggett’s Coat and Badge and of those who work on the River Thames, the watermen and lightermen. Last summer, HTBS reported on one of the results of this research, “The World’s Oldest Boat Race Exhibition”, which was then on display in London. 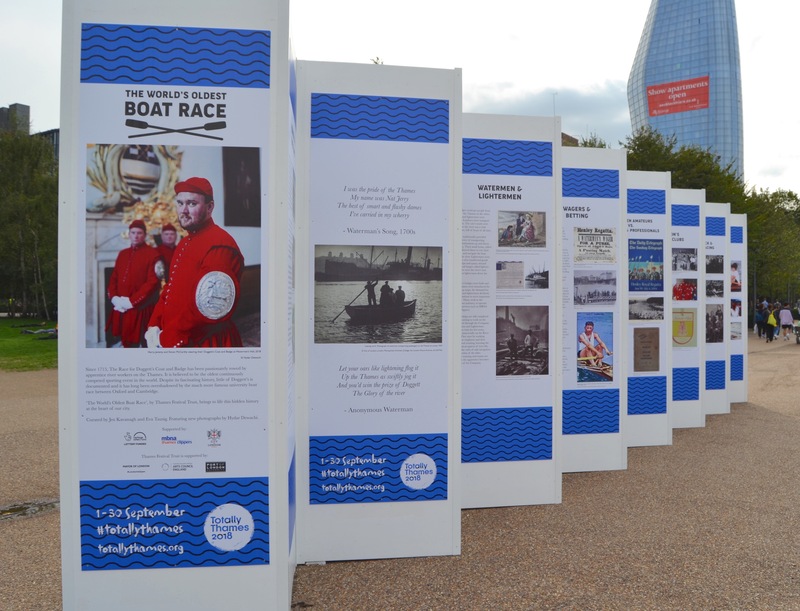 Part of ‘The World’s Oldest Boat Race Exhibition’ outside the Tate Gallery on London’s South Bank last summer. A screenshot of part of the homepage of The World’s Oldest Boat Race. It invites the reader/listener/viewer to watch the new documentary on Doggett’s and the Thames Watermen; to discover the history of the Doggett’s Race; to listen to recordings of stories of the river by those who know it best; and to explore some of the archive of the Fishmongers’ Company, the descendant of the medieval trade guild that has run the Doggett’s Race since its eponymous founder’s death in 1722. This film brings to life a hidden history at the very heart of London, passed down through generations of Thames Waterman. We follow Alfie and George in the lead up to the 2018 race and interview past winners and competitors who tell us the coveted race’s history and the fierce rivalries and family traditions that have ensured it has continued for so many years. 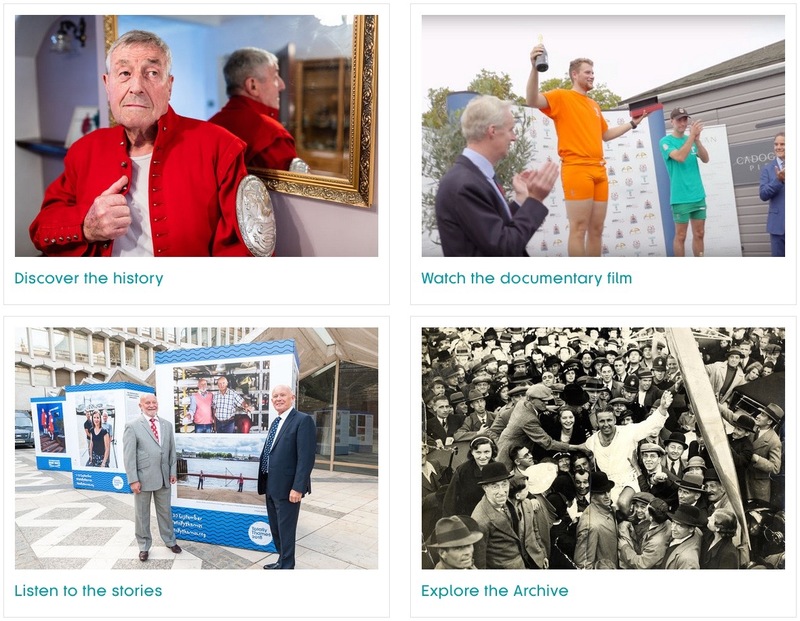 This film is part of the Thames Festival Trust’s heritage project, The World’s Oldest Boat Race, supported by the Heritage Lottery Fund, City of London Corporation, and MBN Thames Clippers. 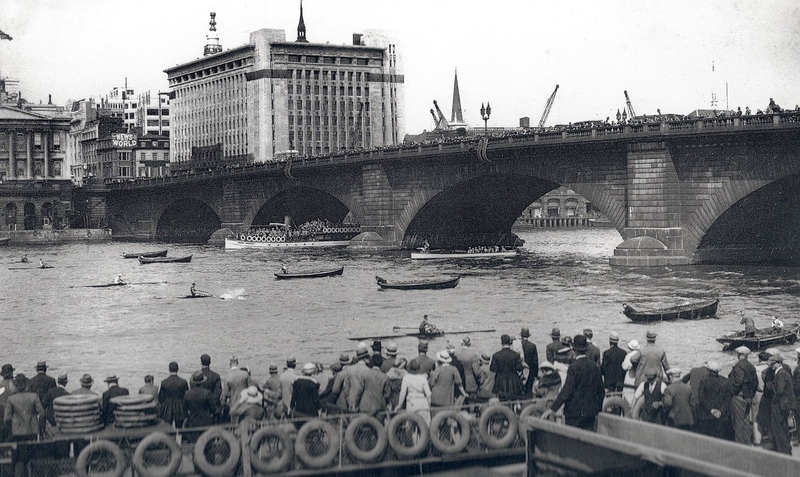 Discover the history is the online version of last summer’s “The World’s Oldest Boat Race Exhibition” , held in London. High resolution pictures illustrate pages on: Rowing on the River Thames; Watermen and Lightermen; Wagers and Betting; Doggett’s Coat and Badge; Gentlemen Amateurs vs Tradesmen and Professionals; The Women of Doggett’s; Doggett’s Families and Traditions; Waterman’s Hall and the McCarthy Family; The Spencer Family and Rowing’s Changing Demographic; Watermen of the Thames Today; The Future of Doggett’s. A McCarthy family affair: From left to right, Jeremy (won Doggett’s in 1992), Harry (won 2014), and Simon (won 1984). Picture: Simon McCarthy. A Dwan family affair: In front, Merlin (2012), back and left to right, Nicolas (2002), Kenny (1971), John (1977) and Robert (2004). Listen to the stories is a particularly important part of the project as it contains audio recordings (and the written transcripts thereof) of hour-long interviews carried out in 2018 with more than twenty people who are long connected to the Thames, most of them Doggett’s winners. Picking a transcript at random, below is a small part (highly abridged) of the interview with Ken Dwan, who won Doggett’s in 1971. 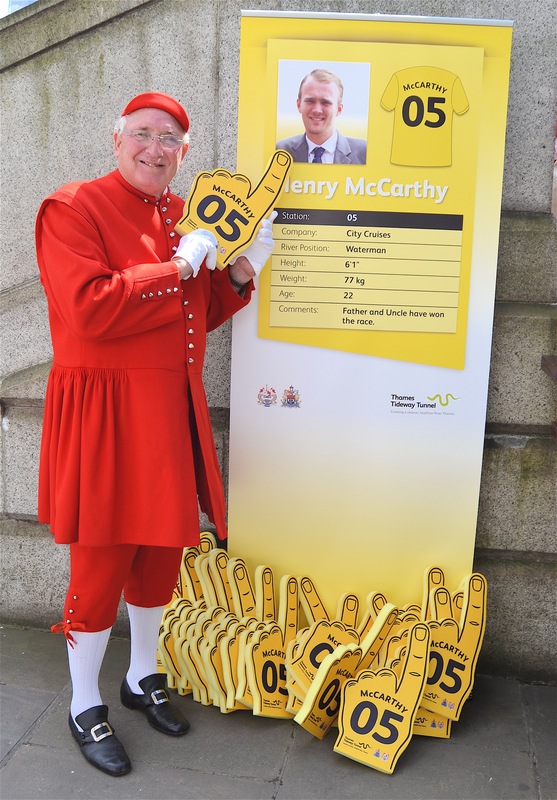 He was Britain’s best single sculler in the late 1960s and early 1970s. He sculled at the European Championships in 1969 and 1971, at the World Championships in 1970, and at the Olympic Games in 1968 and 1972. At Henley in 1968, he reached the final of the Diamond Sculls. He won the Tideway Scullers Head 1969 – 1971 and again in 1973. Further, Ken won the Wingfield Sculls six times, 1968 – 1972 and again in 1975. 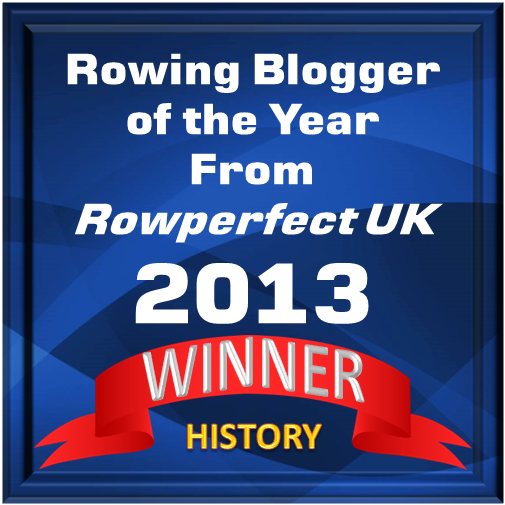 I started rowing…. at nine, I went to a rowing club at Poplar and Blackwall on the Isle of Dogs, which was predominantly watermen and dockers…. boilermakers and people who worked on or around the river… I (started) as a coxswain and learned to steer… but I was always too fat to be pulled along so they used to chuck me in a sculling boat…. (At) that time the river was a very, very different river than it is now. You know, you had ships running around and you had barges and tugs, you had passenger boats and watermen’s boats, the river was just a maze of activity, ships going there, 3,000, and 10,000 ton ships and there would be us nine-year-old kids in our little sculling boats getting in everyone’s way. (My) grandfather said I was going to be the first one to win Doggett’s in the family, so it was just one of them things that I progressed into, it was something I was going to do…. Ken Dwan pictured in 2014. (Rowing) ruined me work afloat…. I used to go rowing probably from the age of about 15… I would probably train about seven hours a day, seven days a week. And the companies that I worked for and the men that I worked with knew that I was rowing and (it) was, you know, encouraged… So…on the Friday night they’d send me to a lighterage company or someone, here, there, wherever, and they’d say to me ‘now do you want to go to work or do you want to go rowing?’ And I’d say, ‘Well how busy are you? Not all that busy? All right, well I’ll go rowing for the week’. But then… by the Friday I’d have forgotten where I was working in the first place, or who I was working for…. When Doggett’s drew the crowds: the start of the 1934 race. 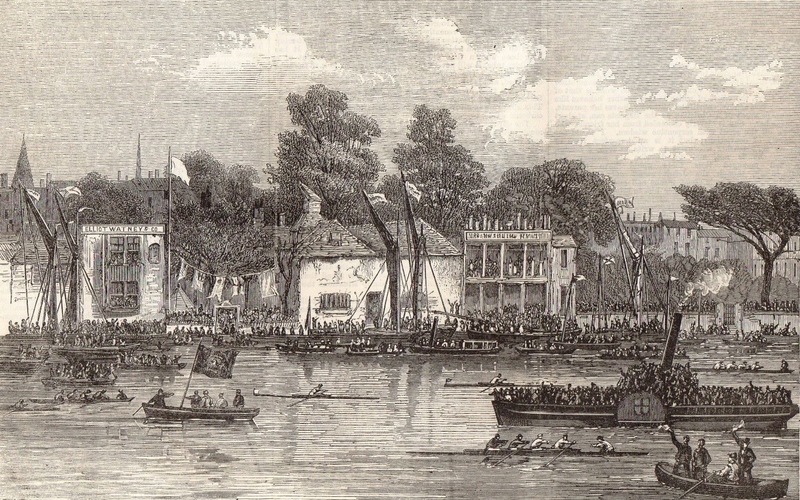 When Doggett’s drew the crowds: the end of the 1869 race. After Thomas Doggett’s death in 1722, the Fishmongers’ Company took over responsibility for the Race….. A team of volunteers has catalogued and digitised archive material from Fishmongers’ Hall, now made publicly accessible for the first time. The archive is made up of loose material and two large scrapbooks, from which a selection of images are displayed by decade. 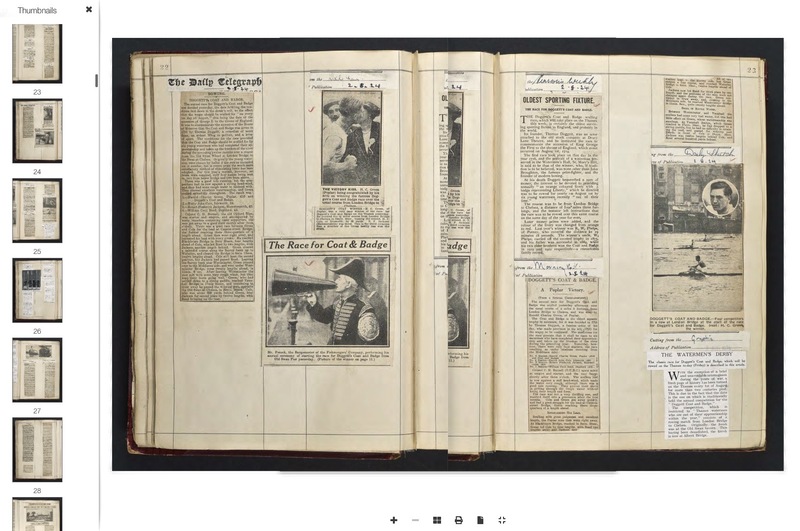 A screenshot showing one of the scanned scrapbooks belonging to the Fishmongers’ Company. Online, its 230 pages can be ‘turned’. Not all the cuttings are concerned with Doggett’s, there are items concerning general rowing, City of London matters, and the Company’s particular interests. Technical notes: Your Flash Player needs to be up-to-date to view all the pictures on the Trust website. Also, much of the material is best accessed on a desktop or laptop computer as mobile devices will take longer to load. 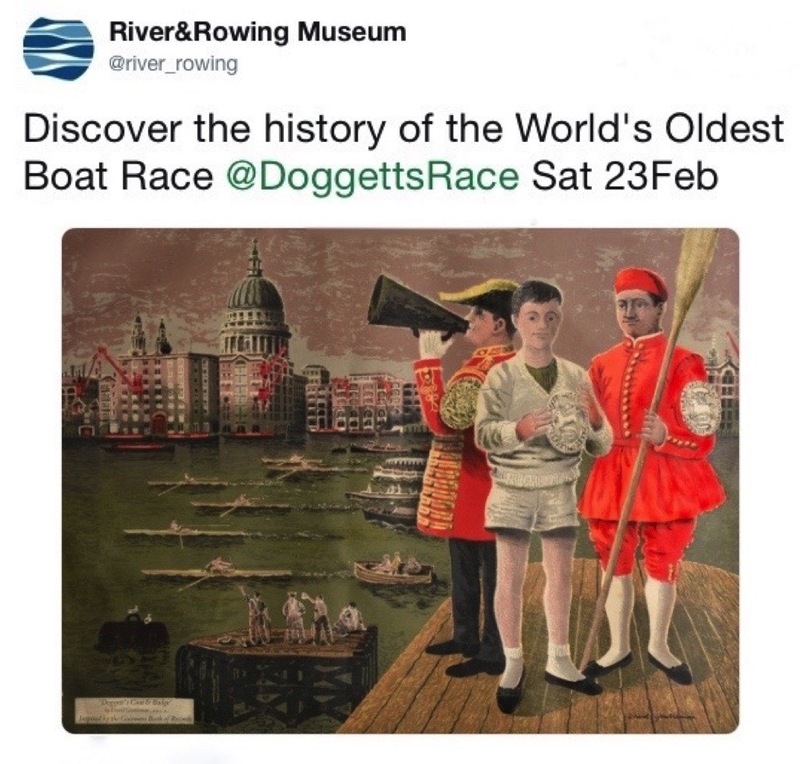 On 23 February, Henley’s River and Rowing Museum (RRM) is holding an event that invites you to ‘discover the hidden history of the world’s oldest boat race – the Race for Doggett’s Coat and Badge’. An introduction to the history of the race exploring the Museum’s collection on display and the chance to see objects from the RRM archives. 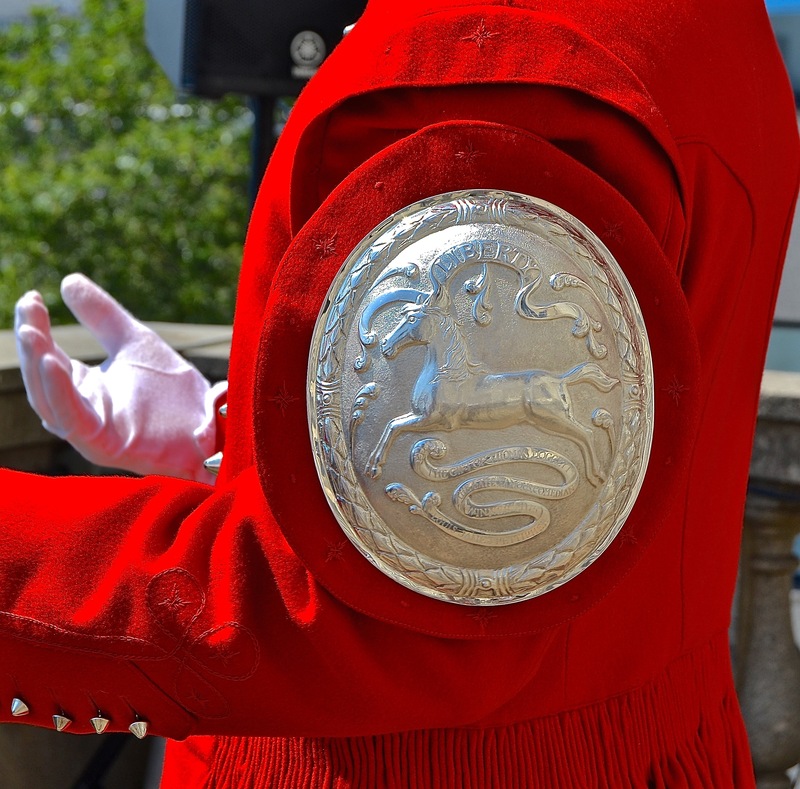 The story of the project bringing this tradition to life through oral history, photographs and one hundred years of archive material made publicly accessible for the first time. 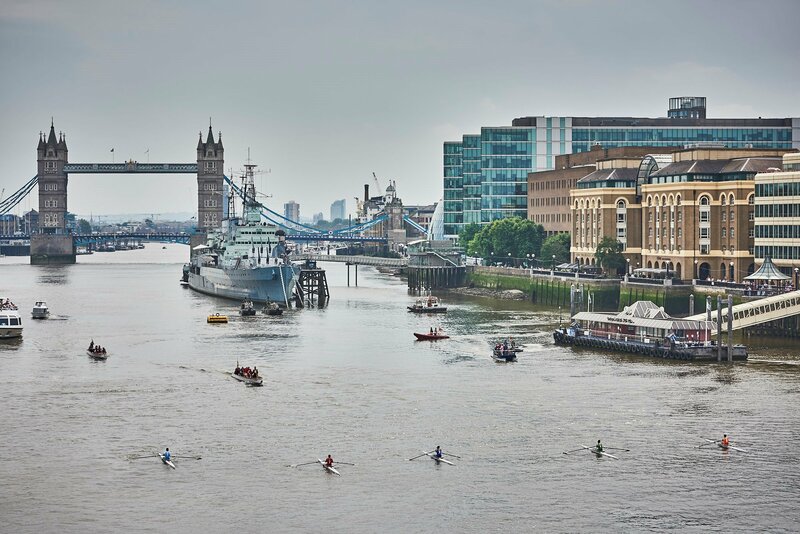 The showing of a new film from the Thames Festival Trust, The World’s Oldest Boat Race. Tickets are £10, to book call 01491 415600 or go online. Louis Pettipher is very jubilant. This is either because he has just won the 2015 Doggett’s Coat and Badge, or because he has just heard that a fascinating resource for rowing historians and others will come online in 2019.